The majestic view of Hay Bluff from New Inn Brilley. Tashi presents a unique opportunity to thoroughly learn the art of Tibetan handwriting in the conducive and beautiful border countryside of Wales. During the eight-day calligraphy meditation retreat, Tashi will instruct how to properly construct the classical Uchen script, from the foundation of the alphabet through to the many subjoined letters, onto forming words and sentences in a coherent and beautiful formation. The remaining days of the course will focus on forming traditional mantras as well as seed syllables as a useful aid to Buddhist visualisation practices. It would be helpful for first-timers to at least become familiar with the Tibetan alphabet before attending the course. If this calligraphy retreat proves successful, it may become an annual event that focuses on one of the several different Tibetan script styles with each year. Location: The blessed abode of Karma Dechen Choling at New Inn Brilley is situated on the Welsh, Herefordshire border. 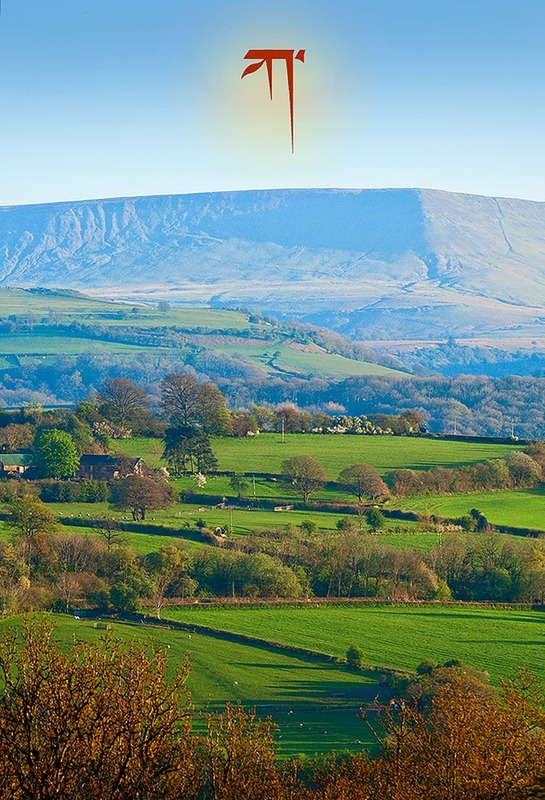 Described as being ‘unique, authentic and a little bit quirky’ it has magnificent views across the Wye valley toward the majestic Black Mountains of the Brecon Beacon National Park, that evokes an ideally peaceful retreat atmosphere of clarity and focus. Alastair Sawday B&B award winning New Inn at Brilley offers a variety of charming accommodation options to suite most needs, from camping, shared dormitories of 'Angels', 'Heaven and Earth' and the 'Self-catering suite' (though you will be catered for during the retreat) to the luxury of double bedrooms in the old Inn. Please see price tariff below. To choose the type of accommodation you would be most comfortable with, please look into the website of New Inn Brilley. Please note that the Rising Sun and Wagon accommodation is not available in the calligraphy retreat package, all other accommodation types have been kindly offered at a 20% concession, making the course more affordable for all. Two people sharing same double - £480 each. booking deposit: £192 GBP each. To book: Please contact Tashi by email contact@tashimannox.com to check availability and secure your place. Course capacity and accommodation is limited. A booking deposit of 40% is required as indicated above. Remaining paid within one months prior to arrival. How to get there: By public transport, the nearest Local train station is Hereford with direct links from London Paddington. Across from Hereford station concourse is a local 39 bus, Brecon service*1 alight at Hay-on-Wye, taxi*2 ride of 8 minutes from Hay-on-Wye to New Inn at Brilley. Please follow the link for map and directions by car. Arrive by Friday evening or early Saturday morning before 10 am. 4.20 pm meditation and free style calligraphy demonstration. Depart New Inn Brilley before 12 noon. Tibetan calligraphy course in London. 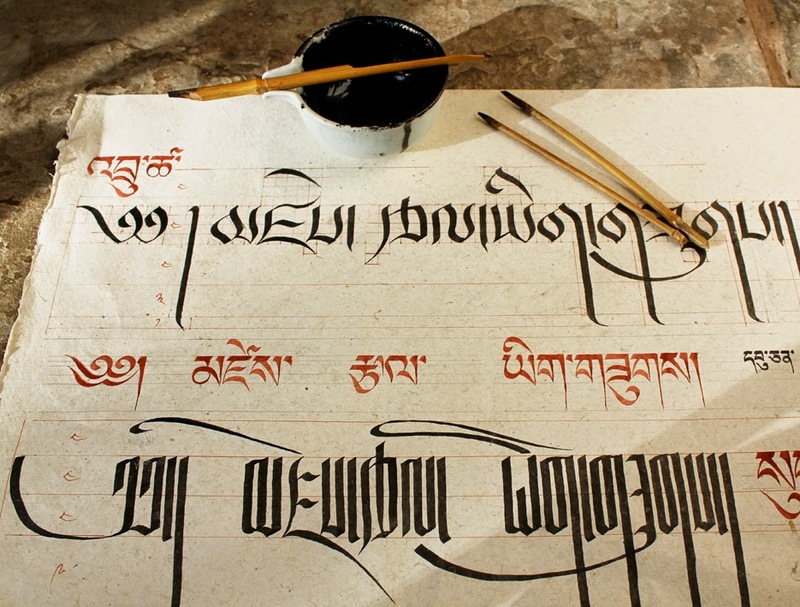 Learn the art of Tibetan handwriting in the Classic Uchen script style with Tashi Mannox. This is a weekend course suitable for first-timers as well as those already practiced in Tibetan writing. Situated at the delightful premises of Samye Dzong London, Spa Road, Bermondsey. on the weekend of the 25th - 26th July 2015. Please follow the link here to reserve a place on the course. 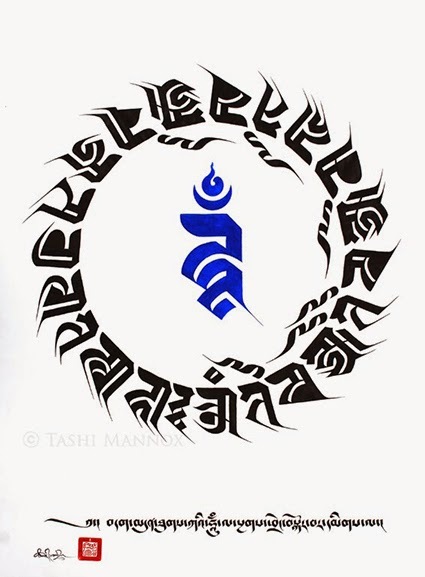 As an introduction, Tashi will also give a public talk on the role of calligraphy and art within Dharma 7:00 - 8:30 pm on Friday 24th July 2015. 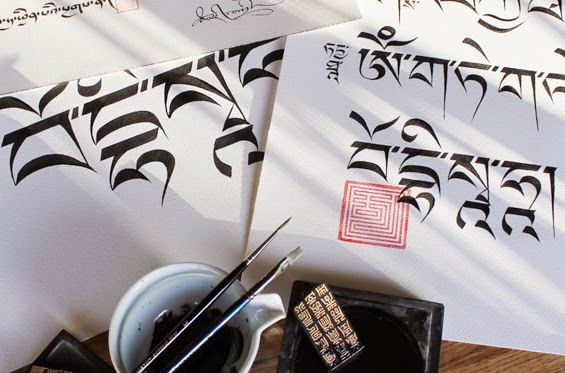 If you wish to further your skills in Tibetan calligraphy there is also an opportunity to fully learn during this summer August Calligraphy/meditation retreat in the beautiful and peaceful setting of the Welsh borders. Please follow the link here for more information. 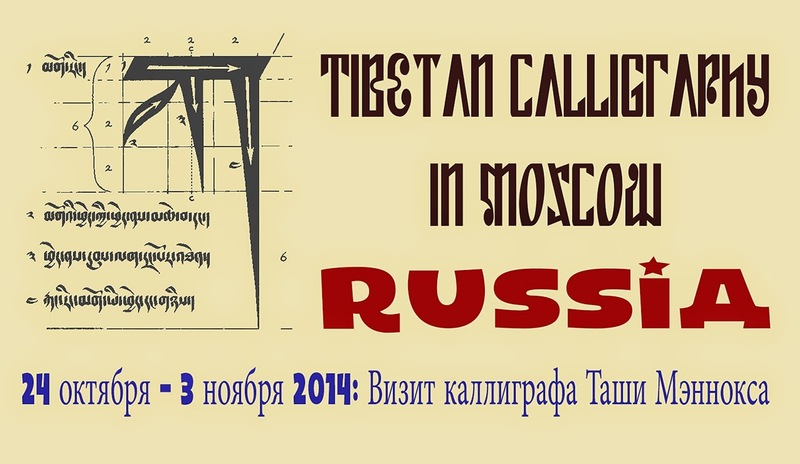 From the 24th October to 3rd November 2014, Tashi Mannox will be in Moscow to open his first solo exhibition in Russia as well as to lead a Tibetan calligraphy course and well as other public talks. For more information about the program of events and to book a place on the calligraphy course, please visit the website of the 'Foundation of Contemplative Studies'. who are hosting Tashi during his short stay in Moscow. The exhibition shows several original art pieces and limited edition prints that span his 15 years of creativity within the art world can be seen at the "Two Empires" gallery on Voznesensky, a side-street just minutes from Red Square at the very heart of Moscow. 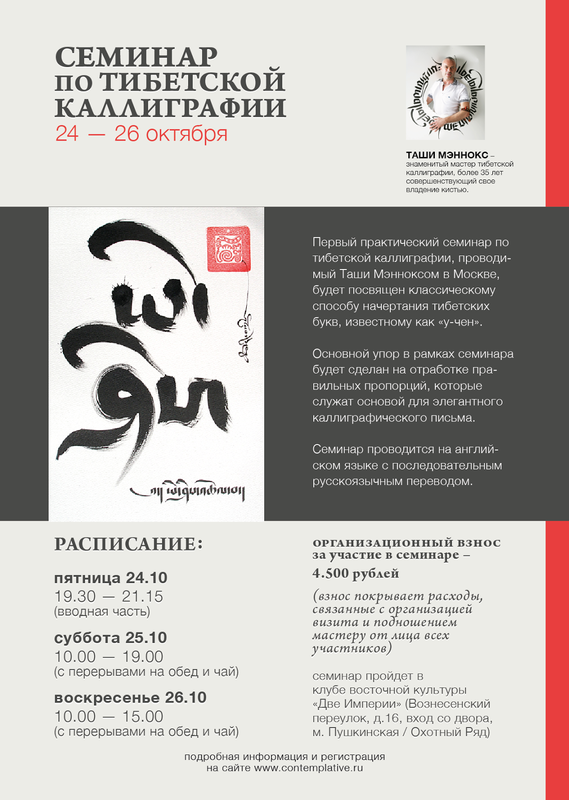 On Sunday 2pm, November 2nd Tashi will give a lecture on 'The Art of Tibetan calligraphy' at the prestigious Contemporary Museum of Calligraphy. Tashi has been a long term participant with the Contemporary Calligraphy Museum whom during this time will show a number of other of Tashi's art pieces that have been both donated and on loan with the Museum since 2008. Click here to see these other works with the Contemporary Museum of Calligrahy. Illustrated construction of hum in both Uchen and Umed script styles. 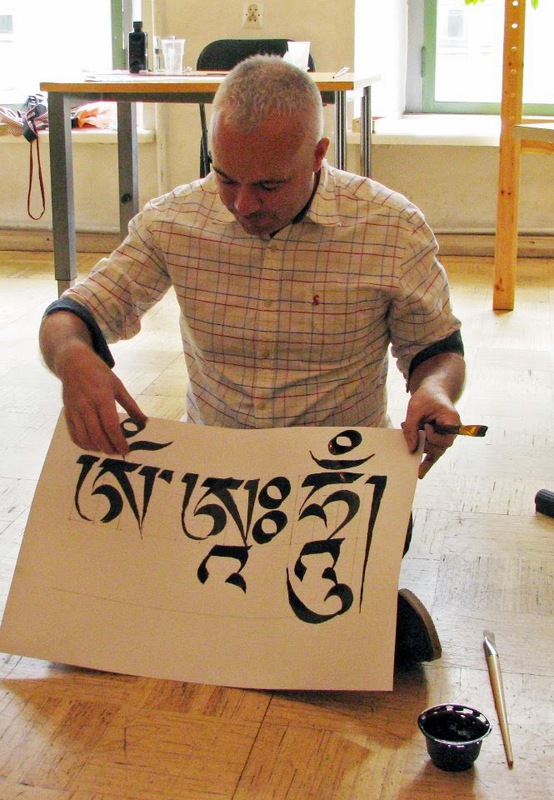 This is the first time Tashi Mannox instructs Tibetan calligraphy in Italy. Two intensive weekend courses in two beautiful locations of Venice and Merigar West in Tuscany. The first workshop in Venice covers how to write the classical Uchen script to the correct traditional proportions that will lay a firm foundation in confidently writing elegant calligraphy. The second workshop a week later in Tuscany teaches how to write the Tsugtung style of the Umed script category. 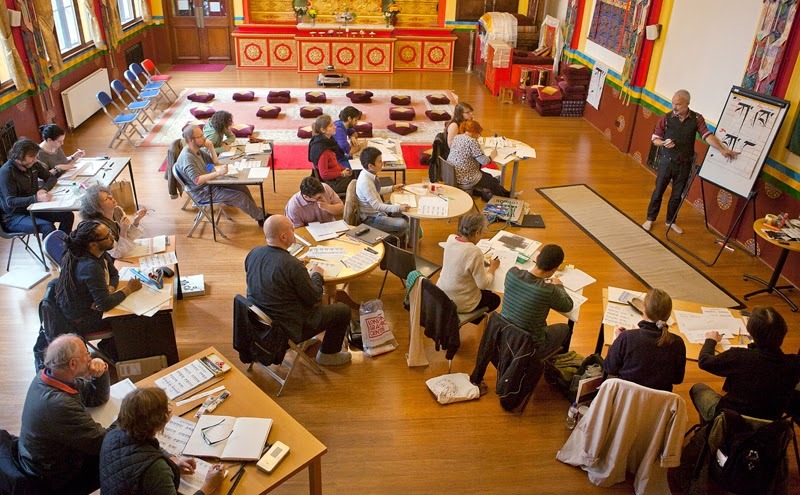 This course is more suited to those with some knowledge of the Tibetan written language. The calligraphy course venue in Venice is the large building on the right. Uchen calligraphy course in Venice. The course will be in English and if necessary it will be translated into Italian. Rates: €150 including coffee / tea breaks with biscuits snacks drinks and fruit inside You can book the excellent vegetarian lunch it costs €15. €250 if attending both workshops, in Venice (Uchen) and Merigar (Umed). Location: 143 S.Croce, Fondamenta Minotto, Rio del Gaffaro (very near to Fondamenta dei Tolentini) within walking distance from Piazzale Roma (bus terminus) and from S.Lucia Venice train station. For more details and direct bookings, please visit the main website here. Equipment to bring: An A4 pad of good quality water colour paper, a rule, pencil and sharpener, eraser and calligraphy ink pens of different sizes. Italic felt-tip calligraphy pens are recommended or the more advanced Pilot Parallel Pens. Examples of the Drutsa, Uchen and Tsugring script styles. Date: Friday 28th November 20:00 - 21:30 PM (presentation) Free entrance ! Location: Merigar, 58031 Arcidosso, Grosseto, Tuscany. Accomodation Facilities: Merigar offers plenty of accommodation types to its visitors. you can choose from a list of budget to upper class solutions by visiting the website here. All across Asia, calligraphy carved into wood is traditionally used to prominently display building names, placed above doorways of temples, palaces and shops. The natural grain and figure of wood makes a beautiful natural ground for fine calligraphy, a match made in heaven, or painted in the classical combination of lapis blue with gilt gold letters carved in relief, such as the above sign that sits pride of place over the main entrance of the Lama temple in Beijing. 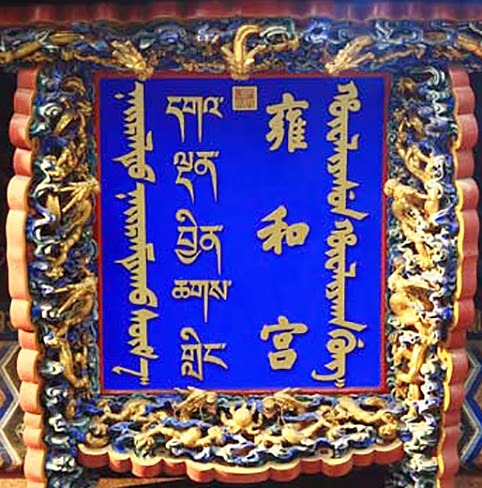 Also common on temples in Tibet, this sign gives the name "The blessed place of tushita heavenly joy" typically in three languages: Mongolian, Tibetan and Chinese. In contrast is the below sign is from a Japanese sweet store that reads "Forever Happiness"
A contemporary combination of natural wood and calligraphy has been artfully explored by Vermont based Tim Brookes, who runs the worthy 'Endangered Alphabets Project'. 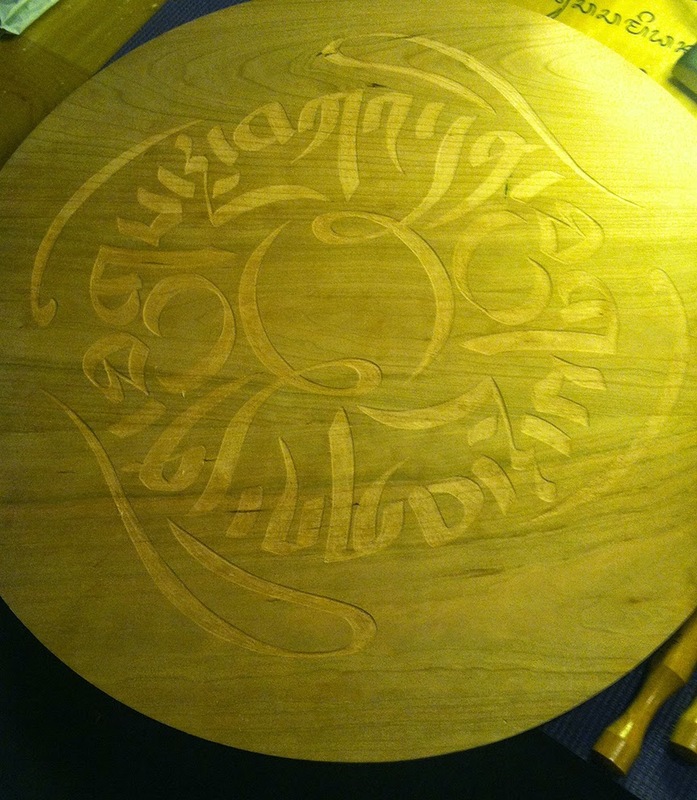 Tim recently contacted Tashi to carve his Tibetan calligraphy in wood, an on-going project that in time will boast a number of hand carved master pieces, which are intended to raise funds toward Rokpa International that has many projects in the Tibetan homeland, such as the preservation and education of the Tibetan language. 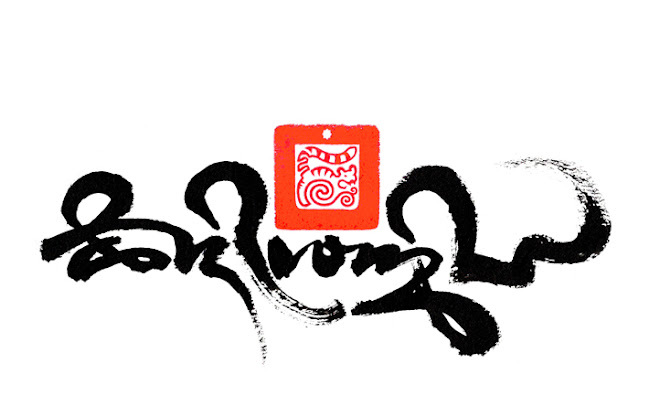 Above, "Moon over Water" is a piece created by Tim Brookes using calligraphy by Tashi Mannox, the top left ideograph is the word moon the Tibetan Drutsa script. Below right is a Wartu Sanskrit monogram of two words Eh and Vam. for a greater explanation of Eh-Vam, please follow the link here. 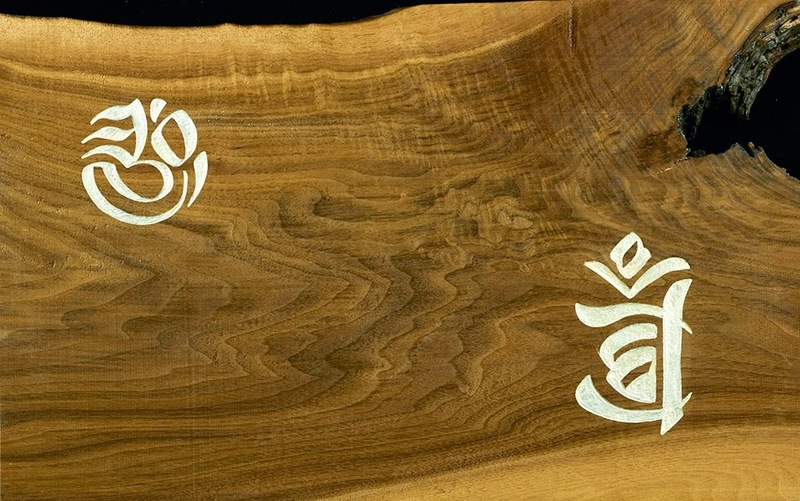 Here below is another wood carving shown though the process of creation by the skilful hand of Tim Brookers, once again using a Tashi calligraphy as the subject. The words "Graceful Kindness"arranged as a circular design is also a popular tattoo design and available as a high resolution down-load. Statement by His Holiness the 17th Gyalwang Karmapa Ogyen Trinley Dorje on the Passing of Kunzig Shamar Rinpoche, Mipham Chokyi Lodro. Until the 10th Shamarpa, the omniscient Shamarpas have been great masters respected throughout Tibet, especially within the Karma Kamtsang Lineage where he was known as the Victorious Lord of Dance and the lineage’s strength and embodiment of wisdom, compassion and power. 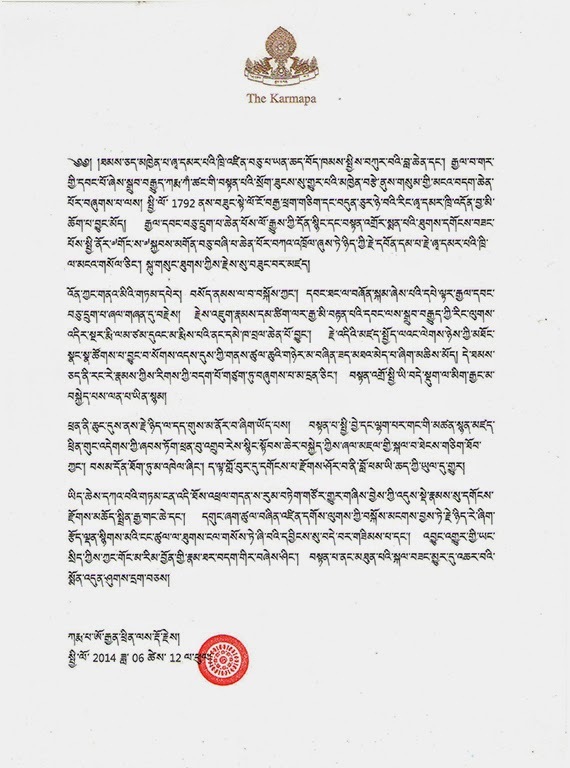 Despite a ban on the Shamarpas’ enthronement since 1792 for almost a century and seventy years, His Holiness the 16th Gyalwang Karmapa, in view of historical significance and for the benefit of Buddhadharma and all beings, sought consent from His Holiness the 14th Dalai Lama and enthroned his nephew as the Shamarpa, taking him under his wing for the guidance of his body, speech and mind. However, as the folk saying goes, one may be fortunate to have a cow but not enough to get its milk. Similarly, after the Parinirvana of the16th Gyalwang Karmapa, due to wavering of commitment amongst his followers, a great schism occurred within the lineage. It was an unprecedented disharmony that is unimaginable even in a dream. 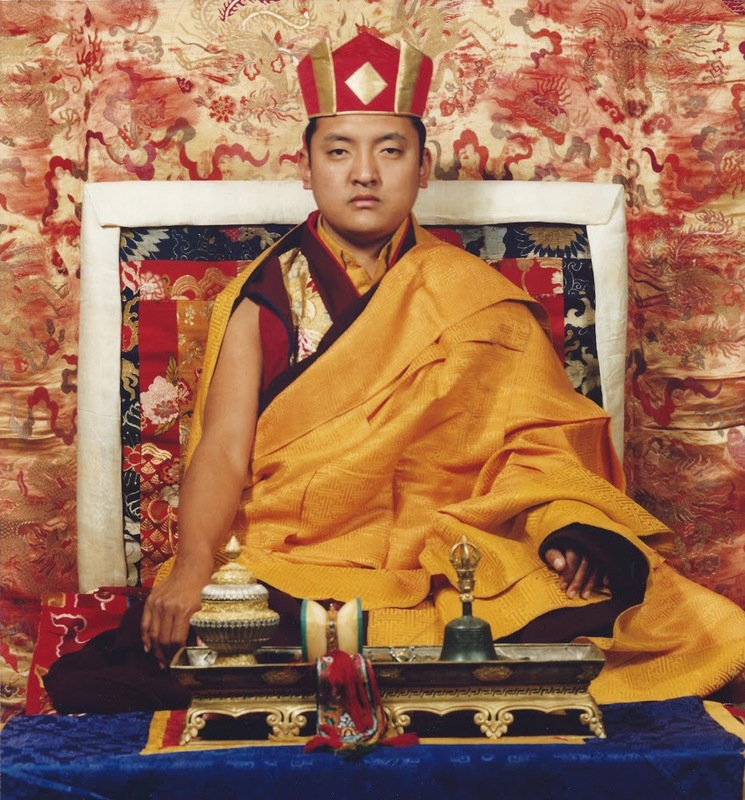 Shamar Rinpoche’s activities have also been in various forms, both favourable and unfavourable and likewise, there are many past circumstances similar to endless ripples across water. These unfortunate situations are, I think, simply due to us not being aware of the omnipresence of our root guru and not being able to generate farsightedness for the benefit of Buddhadharma and all sentient beings. I have had an unmistakable faith and respect towards Rinpoche from the time I was young. Therefore, with the hope of benefiting the Buddhadharma in general and the lineage in particular, and with the expectation that I may be able to offer some service towards his Dharma activities, I had the good fortune of meeting Rinpoche once. Yet, as my aspirations have not been fulfilled, his sudden passing away is a matter of great sadness. As soon as I came to know of this hard to believe news, I instructed Rumtek Monastery, the main seat of our lineage and other monasteries to make offerings and perform pujas as grand as possible for 49 days, as Rinpoche has taken rest from the degenerate age of strife into the expanse of peace for a while. With great hope and strong aspirations that Shamar Rinpoche’s reincarnation will embody the life stories of his predecessors, and the good fortune of harmony within the lineage will arise soon. 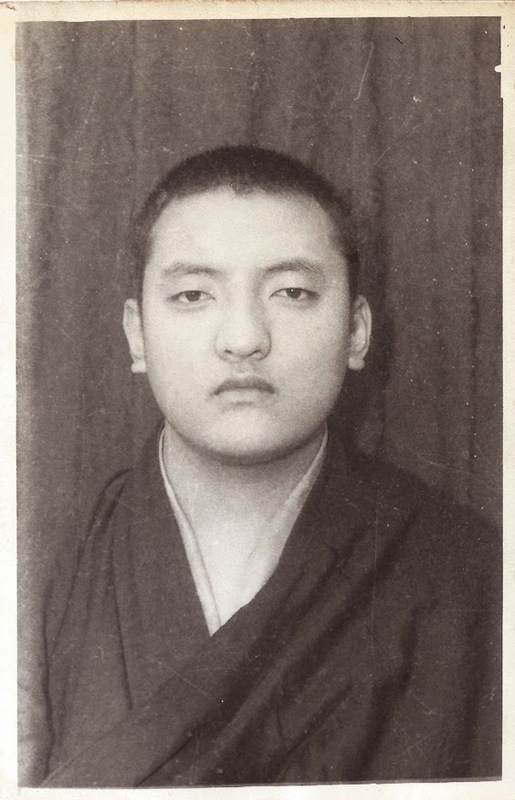 Shamarpa as a young regent looking like Buddha. Photograph belonging to Tashi Mannox. K.T.D. Woodstock, New York State, U.S.A.
K.D.D.L. (Samye Ling) Dumfriesshire, Scotland, UK. As part of the "Bodies in Balance" Tibetan Medicine exhibition at the Rubin Museum of Art in NYC, Tashi Mannox gives a lecture and calligraphy interactive "The Painted Mantra". Participants are invited to join Tashi in creating the sacred proportion and significance of the, seed syllable of Medicine Buddha that is essential to the visualisation practice around which the mantra of healing is arranged. The lecture begins with an explanation of Dharma art and its practical role historically and for a person on the spiritual path. The lecture concludes with creating a contemporary rendition of the Tibetan medical tree of diagnosis, whereby participants will be invited to ink their thumbs or fingers to print as leaves on the calligraphy tree. Edie Irwin of Rokpa International finishes the talk with a few words about Rokpa's charitable work regarding current Tibetan medicine practices in Tibet. "The Painted Mantra" from 7 - 9pm, Wednesday 2nd April 2014, for bookings please follow the link here. Following Tashi's talk at the Rubin, on the 4th-5th and 6th April, he will lead an intensive workshop in Tibetan calligraphy held at the Shang Shung Institute Library in Conway, Massachusetts. 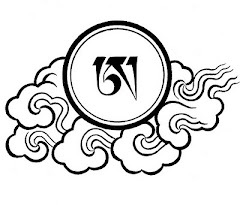 According the the visualisation of the Medicine Buddha sādhanā, the dhāraṇī mantra of Medicine Buddha turns clockwise around the seed syllable hum, as illustrated above in blue. 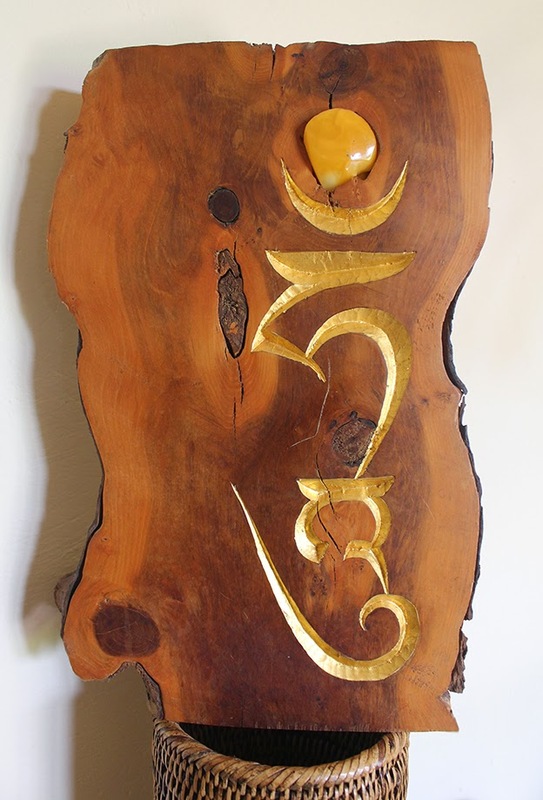 The line of small text at the base of the above art piece translates as "The hum in the heart of the self and the front visualisations is surrounded by the mantra garland"
It is impossible of course, to illustrate the turning of the mantra in such a way as a calligraphy on a flat piece of paper, so to illustrate this, the mantra is depicted starting at the bottom of a circle of text that reads to follow anticlockwise. 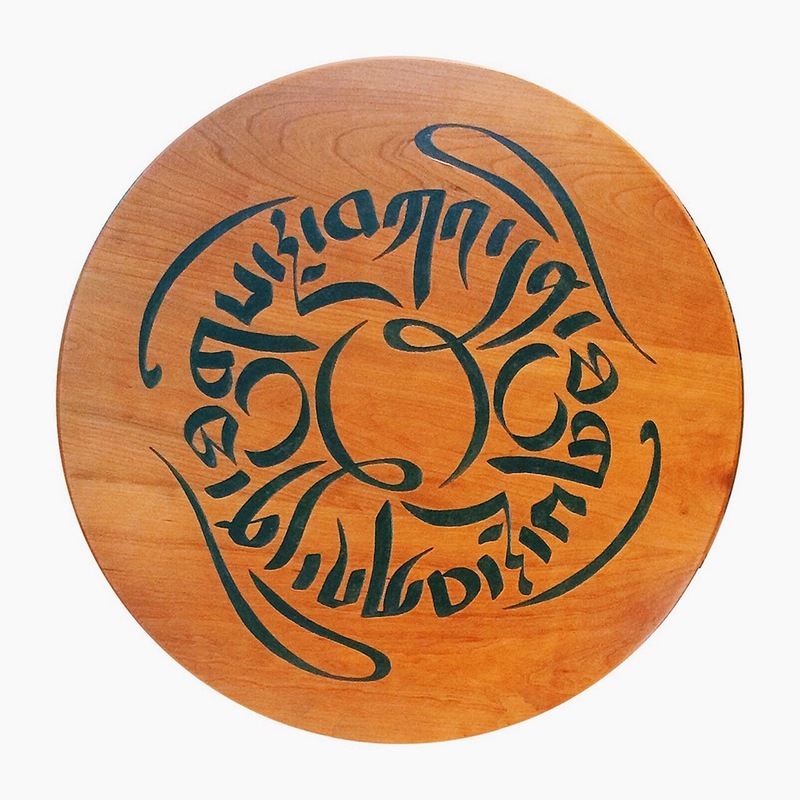 If the circle would be movable, fixing the gaze to read the mantra at one fixed point, the circle of text would turn clockwise. 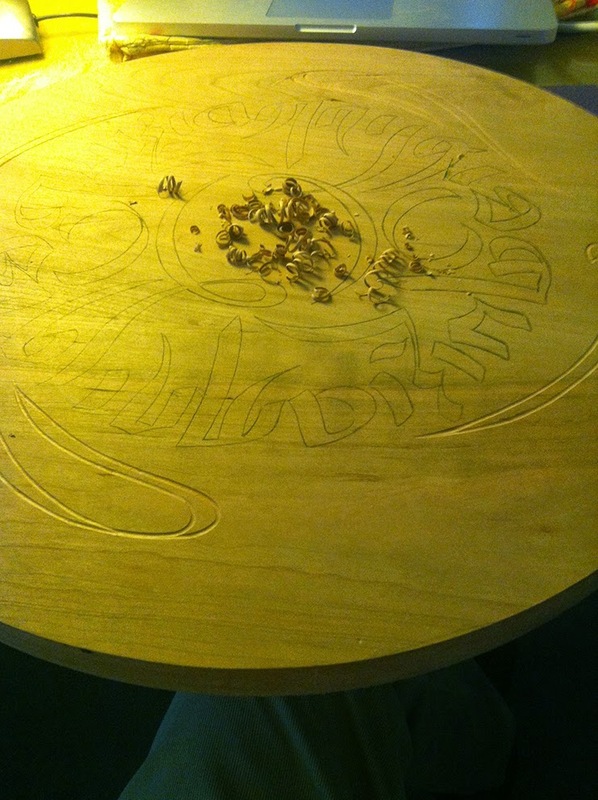 In creating this art-piece, Tashi needed to take particular care to organise the length of the mantra to fit the full circle, much calculation and measurements in preparation was needed. 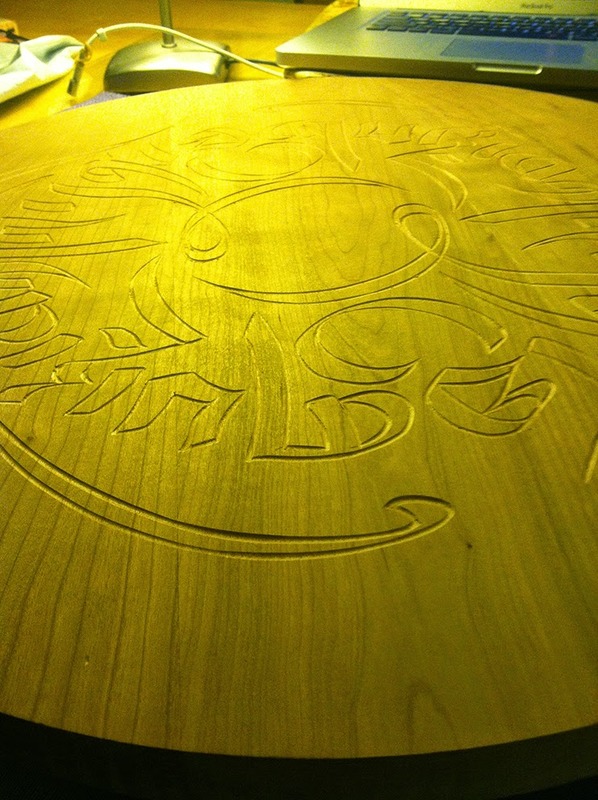 Each character of the mantra and the seed syllable at the centre was traced and positioned before inking in. Using a window makes a very effective 'light-box' when tracing the reverse of the image before applying to the artwork. In filling with black ink. This art piece was especially created for the Rubin Museum of Art as part of their "Bodies in Balance" exhibition of Tibetan medical art. 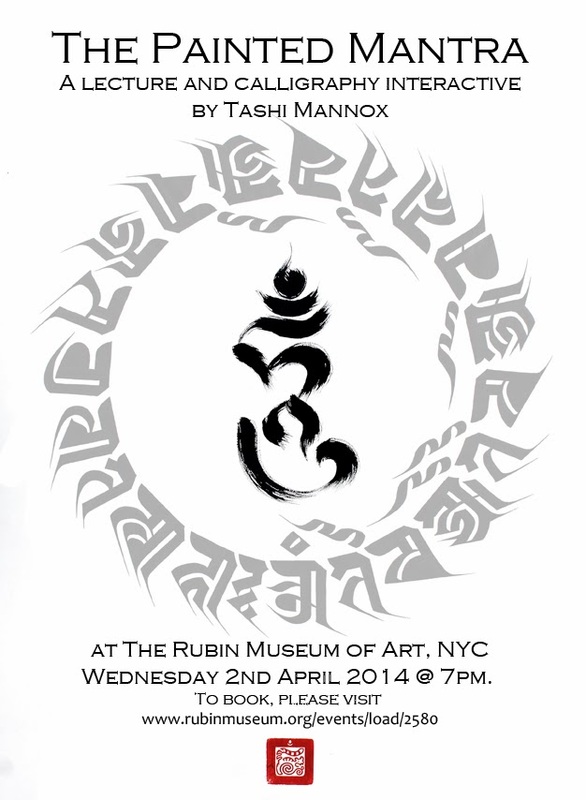 Tashi gives a lecture/calligraphy interactive at the Rubin on the 2nd April 2014, for more details please follow the link here. 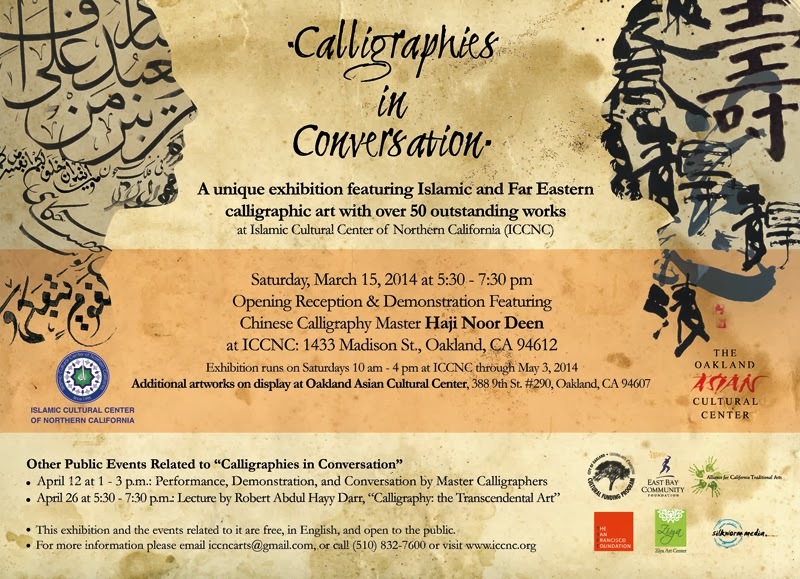 Calligraphies in Conversation is an international exhibition at the Islamic Cultural Center of Northern California (ICCNC) highlighting traditional Middle Eastern and Islamic calligraphic art in dialogue with other calligraphy traditions specially Far East calligraphy. “Calligraphies in Conversation” runs from March to May 2014 and focuses on the connections between Islamic and Eastern calligraphic traditions. ICCNC is incredibly excited to pilot this new project in conjunction with Ziya Art Center and partners from nearby Oakland Chinatown such as Oakland Asian Cultural Center. 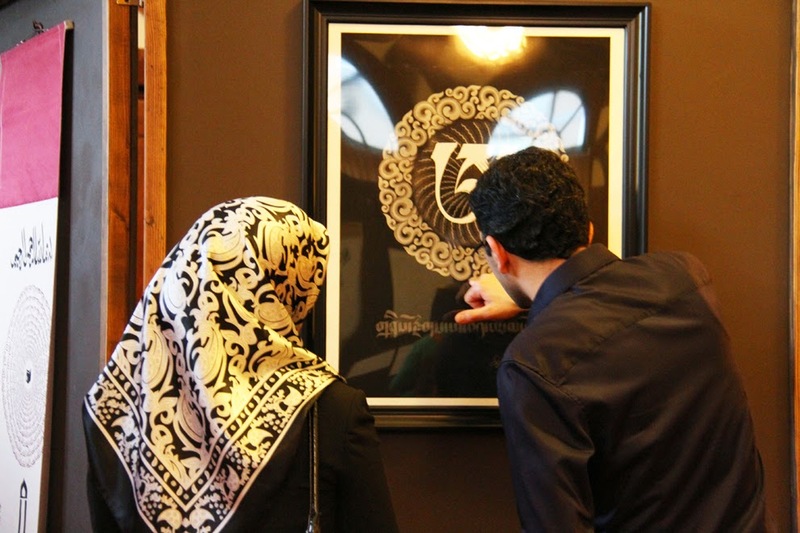 An exhibition of curated and newly-made calligraphy from both traditions will be on display. The Curatorial and Jury Panel consists of ICCNC and Ziya Art Center experts as well as local artists have received over 115 submissions from invited calligraphers and through an open call for artists. 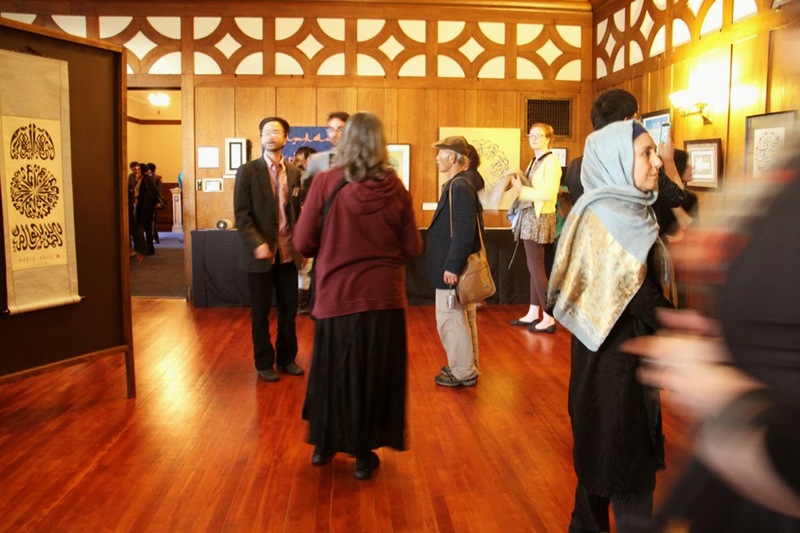 Most of submissions were from the US, mainly Bay Area, California; but there were several international submissions from different countries including Tashi Mannox of the United Kingdom, Shu Yi Liu of China, Mohammad Navid Bazargan of Iran, Uehira Baikei of Japan, and Josh Berer of Turkey. After a competitive jury process close to 50 artworks have been accepted from 20 artists for the exhibit illustrating a diverse array of Chinese, Japanese, Tibetan, Arabic, Persian, and Turkish calligraphy artworks. As an additional goal, the exhibitions, by encompassing traditional artworks of different cultures, aim to foster dialogue between diverse cultures and faiths through a traditional art form. Such viewing combinations are rare in California, and will provide the public with the unique opportunity to recognize shared features: The traditions all highlight the power of written word via inscribing it artistically with pen and ink, and emphasize a direct relationship between spirituality and calligraphy. Being a good calligrapher, in the traditional sense, goes hand in hand with developing strong spirit and character. Above, one of the exhibits from Tashi Mannox entitled "The Great Perfection of Ah" available in the link here to order as a limited edition print. 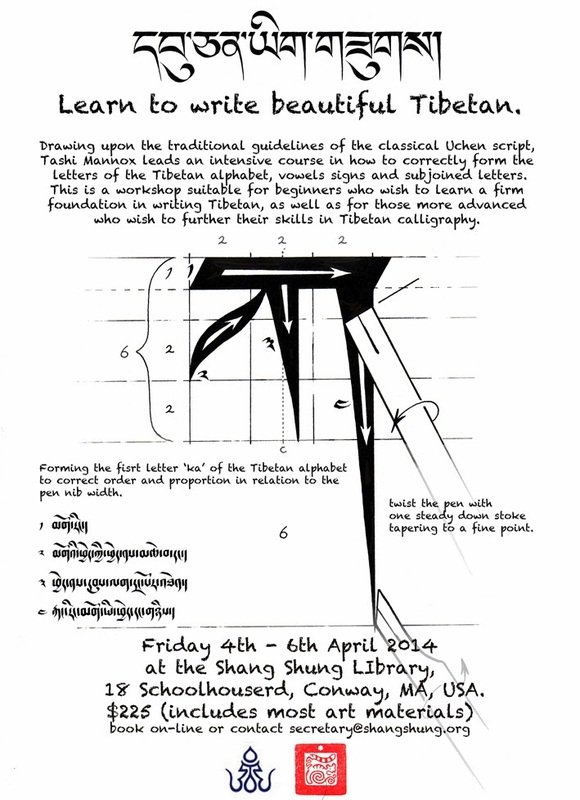 The Dzogchen community in North East America are very pleased to announce that Tashi Mannox, the esteemed master of Tibetan calligraphy, will be in residence at Tsegyalgar East on 4-6th April 2014 at the invitation of Shang Shung Institute USA and Khandroling Paper Cooperative to teach an introduction to Tibetan Calligraphy. WHERE : Shang Shung LIbrary, 18 Schoolhouse Rd. Conway, Massachusetts, USA. 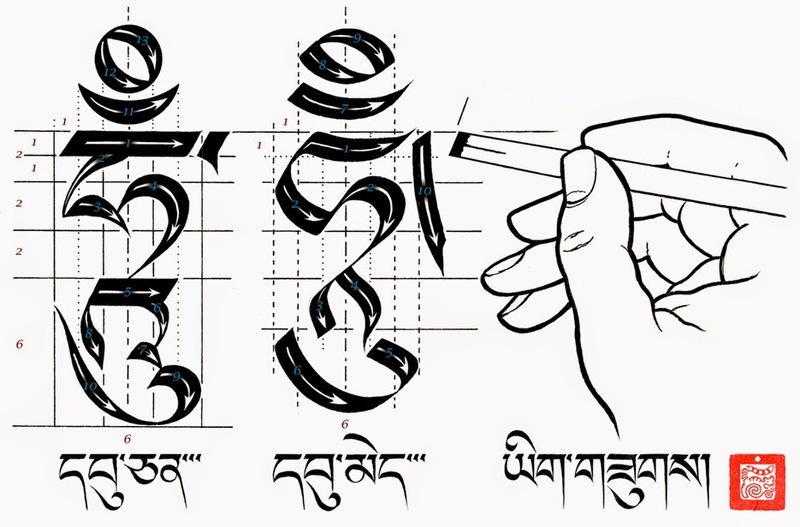 According to Tashi, his calligraphy course will be intensive, to teach the correct proportions and how to form the Uchen letters of the Tibetan alphabet, which alone can take two days. I am very interactive with the students and depending on how many people attending (20 persons to a class is manageable) I like to go around the class to give each individual some personal attention in holding the pen and forming the letters, often writing on their paper to demonstrate each letter. So this will be a course for beginners as well as those who are already practiced in Tibetan. The course starts with a short historic explanation of the Tibetan written language and its spiritual and sacred significance, which I tend to refer to throughout the course. 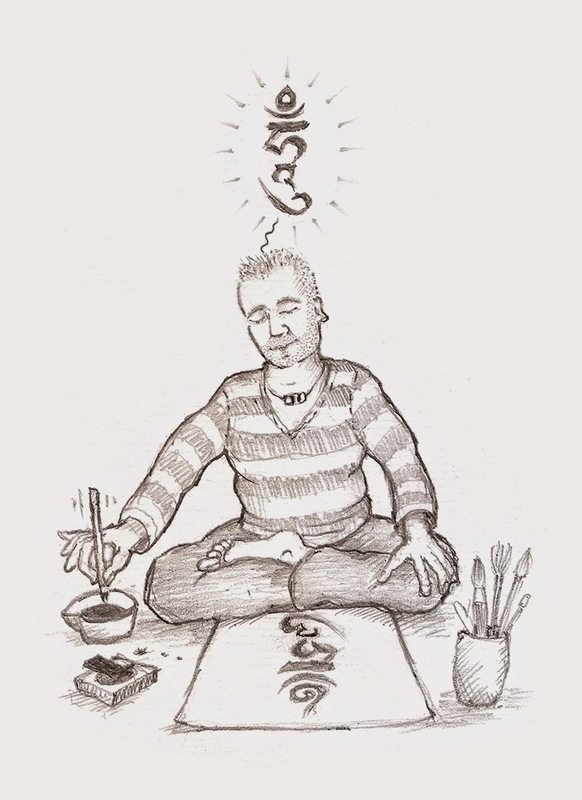 I normally finish the course with teaching the correct way to write the Mani mantra and other key syllables essential for visualisation practices. People love this and go home with their own created art. So the course is teaching a solid foundation in correct proportion and beautifully formed letters, as starting with a firm foundation is essential to creating beautiful calligraphy with the integrity of the tradition it belongs. To view a film about Tashi, click here or visit his exquisite website. Tashi will also be giving a presentation at the Rubin Museum in NYC on April 2, 2014 at 7:30 PM as part of the upcoming exhibition on Tibetan Medicine. Tashi has given many successful workshops in Europe. We are very honored to have him visit us here in the USA. Please pass the word around. Participants from out of town may register to stay in the Tsegyagar East Dormitory onsite. Contact the geko@tsegyalgar.org to make a reservation.